At various times of year, we may feature a seasonal product that is related to but not in our standard product line. Our gift sacks can be created for any occasion or holiday and will include a complimentary handwritten gift card. Don't forget, The ARThritic Hands Company, LLC will soon offer wonderful holiday gifts. Each piece of work is hand made by artisans with arthritis and is truly unique! Fudge In A Silver Frame - the perfect gift for those who love fudgy chocolate. We add plump English walnuts to our chocolate fudge for the perfect combination of creaminess and crunch. 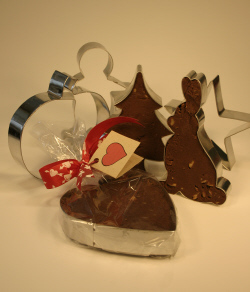 The fudge is packed into an oversized, silver cookie cutter, and then wrapped in a cute bowed cellophane bag with gift tag. Available without nuts, too. Great for the kids, bakers, and of course, sweethearts! Fudge not available in warm months June-August.